1649 participants (including 26 member schools and 22 corporate partners), 30 events and meetings in 3 days, 506 graduating students…. celebrated with 383 bottles of champagne! 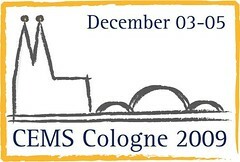 Held on 3rd-5th December the Cologne events featured the induction of new schools and corporate partners. A record 506 graduands received their CEMS MIM diploma at a graduation ceremony that featured keynote speaker Günter Verheugen (Vice-President of the European Commission in charge of Enterprise and Industry). Richard Ivey and Koç will deliver the number one-ranked Master's in Management in the world from August 2010. The annual Courses of the Year were recognised as well as the very first the School of the Year, attributed to the University of St. Gallen. The inaugural CEMS Club of the Year award was announced, with the winning cheque of € 3,000 presented to CEMS Club Prague. Another highlight of the three-day event was the panel debate on the theme of Educating Globally Responsible Leaders. This corporate-academic event brought the vision of two guest speakers: Gary Steel (Executive Committee member responsible for Human Resources, ABB) and Philippe Levêque (Director General of the international NGO Care France). This look to the near future of CEMS was balanced with a farewell to one of the key contributors to the alliance over the past decade and more. Christi Degen, International Relations Director at the Faculty of Management, Economics and Social Sciences at the University of Cologne, was also the CEMS Programme Development Director from 1999 to 2004 and one of the driving forces behind the CEMS MIM.